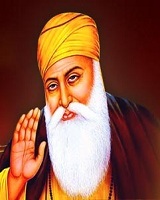 Guru Nanak 15 April 1469 22 September 1539 Indian Mehta Kalu Mata Tripta Guru, Innovator The Founder of Sikhism and the first of the tern Sikh Gurus, he has been called "one of the greatest religious innovators of all time". He teaching the message of one God who dwells in everyone and set up a unique spiritual, Social and political platform based on equality, fraternal love, goodness and virtue. A list of popular Hindi Guru Nanak quotes are given below.